Your gift at any level helps to support the work we do in our community. 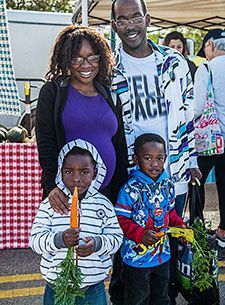 $10 - provides double dollar benefits for fresh fruits and vegetables for a family at the SFC Farmers’ Markets through the Double Dollar Incentive Program. $25 - provides seeds for one community or school garden through the Spread the Harvest program, allowing families to grow nutritious, affordable food for themselves. $50 - provides transplants that will grow into fresh, healthy food at one community or school garden through the Spread the Harvest program. $100 - provides food for two The Happy Kitchen Facilitator Continuing Education classes. $250 - provides childcare and Spanish interpretation for a Basic Organic Gardening class for parents at Sprouting Healthy Kids partner schools. $500 - provides an education and cooking kit for several 6-week Cancer Survivor cooking classes. $1000 - provide groceries for a year of free cooking classes for 150 students. To learn more about how your donation is helping to make sustainable change possible in our community, read our latest annual report. Access to fresh, healthy food is a basic human right. SFC’s Double Dollar Incentive Program (DDIP) allows families like Marquel’s to visit SFC Farmers’ Markets and double the dollar amount that they can spend on fruits and vegetables at the market. 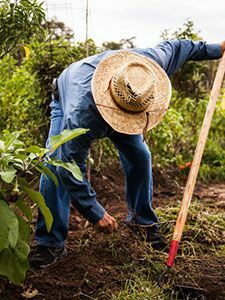 "We grow vegetables because it is an important job that connects us all... It connects us with families who show up when asked to help clean and wash vegetables the day before market. 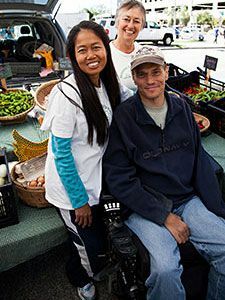 It connects us with all our friends who buy produce from us weekly at farmers’ markets around Austin... Fewer miles from farm to plate mean fresher food and less damage to the environment." "The Happy Kitchen class caused me to be courageous, curious, confident and smarter when choosing foods... I have monitored my blood work and my numbers are healthier since the better choices I have made from taking the class."